For much of the series finale of Unbreakable Kimmy Schmidt, Kimmy Schmidt is bizarrely sidelined. Instead of the finale really focusing on her, she mostly serves as a guide for the other characters. That’s no doubt the role that Kimmy has come to play in her friends’ lives, and the conclusion of her arc does unfold through her attempts to help others in the finale. But there’s a sense that in trying to tie up everything very neatly for a satisfying conclusion, Unbreakable Kimmy Schmidt forces predictable, storybook endings for its characters. That said, it is definitely part of this show’s charm that we continually root for Kimmy. She has had her obstacles, but the show doesn’t beat her down, doesn’t punish her for being so optimistic and selfless. We ultimately root for all of these characters to have happy endings, even the very selfish Titus and Jacqueline. But the way their character arcs wrap up in the finale is hasty, even lazy in some ways. Introducing Eli as a character just last episode for the mere sake of having Jacqueline find love that doesn’t objectify her is too easy. Making Eli blind is a total cop out. It isn’t as funny of a reveal as the show wants it to be, and even though Zachary Quinto gives a good performance that fits in with the show’s overall voice, the whole storyline just doesn’t feel authentic or even particularly resonant for Jacqueline. She tells Kimmy she wants to be the kind of person she can be proud of, and instead we get her just falling for a man? Because he can’t see her? And therefore must definitely respect her for her intelligence? It’s not cogent at all, and it doesn’t represent growth for Jacqueline so much as just landing on the weak punchline of Eli’s blindness. Sure, the dynamic they have in the flash forward—work nemeses who are in love—does seem distinctly Jacqueline. But it’s a frankly boring ending that’s just masquerading as a satisfying one. One of the most compelling Jacqueline scenes in the finale is of her and Kimmy. Jacqueline still relies on Kimmy for comfort, and Kimmy is quick to be what Jacqueline needs, holding her while reciting her coping song about taking things ten seconds at a time. It’s not a joke callback so much as an emotional one. And while some of the plotting in the finale doesn’t have a kick, there’s still strong character work throughout, anchored in particular by Kimmy and the role she plays in everyone lives. Titus gets a similarly uninspired ending. There was never really any doubt that Titus would end up with Mikey. The show has been treating them like endgame for the entire final season. But even still, this grand romantic ending doesn’t feel earned, just forced. Mikey tells Kimmy he really did only ask Titus to sing in his wedding because he was hoping he’d perform one last dramatic gesture to get him back. It tracks that Titus would assume that’s why he’s being asked by his ex to sing in his wedding (the fantasy sequence that follows this Titus realization is great). But it makes way less sense for Mikey to not only have expected it but wanted it. Mikey’s sweetness has long been a contrast to Titus’ self-centeredness. Mikey often pushes Titus to be a better person, but here it’s almost like Titus has influenced Mikey to be a worse person. Inviting your ex to sing in your wedding to another person because you’re still in love with the ex and hoping they’ll help you blow up the wedding? It’s very bad behavior that’s treated as cute. And even putting Titus’ previous actions of manipulating Mikey into getting back with him on a pedestal and painting them as grand romantic gestures is a weird message to send, too. On the surface, maybe this is a happy ending. Maybe Titus has changed. But it’s not a change that makes very much sense, and the way Titus and Mikey end up together is complicated without really being treated as such. It’s a happy ending for the sake of a happy ending. I’ve saved the best for last though, and that’s the culmination of Kimmy Schmidt’s arc. Lillian’s ending—resolving to blow herself up so that she can become a ghost who haunts gentrifiers only to have her plans foiled—is fine and not lifeless in the way Jacqueline and Titus’ finale plotlines are. But it’s really the Kimmy ending that feels the most fitting and genuinely satisfying. For starters, the finale thankfully brings back Xanthippe. Xan and Kimmy’s arc together has been one of the most compelling relationship dynamics on the show, and the way they’ve gone from enemies to Xan reluctantly caring about Kimmy was made very convincing by great writing around them throughout the series. 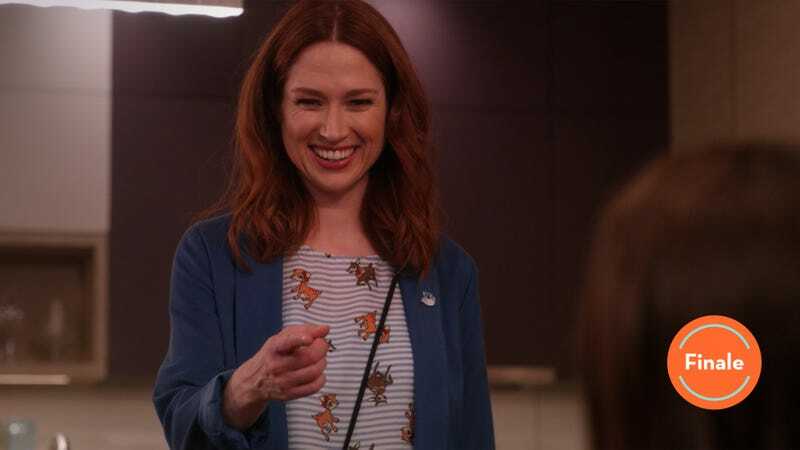 Dylan Gelula and Ellie Kemper have excellent comedic chemistry, and while their scenes here are brief, they play to their strengths. 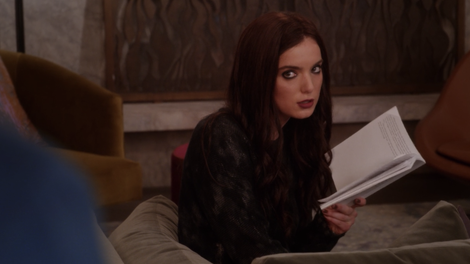 Watching Xanthippe gradually realize that Kimmy wrote her new favorite book is without a doubt the most genuinely satisfying moment of the finale. Not everything about Kimmy’s conclusion hits (the mole women cam girl stuff falls pretty flat), but seeing Kimmy achieve surprise success for the book that she poured so much of herself into is a more apt and meaningful ending for the character than if she’d actually gone through with writing a book about her bunker experience like she initially tells Jacqueline she will at the top of the episode. People love her metaphor-laden fantasy novel teaching people—and young boys in particular—to be good, respectful, and feminist. And it all culminates with a moment so sweet and pure that it’s almost startling. In the very last line of the series, a young boy waiting in line for the new Universal Studios theme park opening that’s based on Kimmy’s book says “Ms. Schmidt, your book makes me feel safe.” It’s an instant tearjerker that taps into the show’s soul. So often Unbreakable Kimmy Schmidt has surprised with the depth and detail it gives to what many dismissed as a premise that wouldn’t work and could never be funny. Kimmy’s traumatic past wasn’t just an attention-grabbing premise; it’s a huge part of the show’s ethos, a continual thematic through-line that has taken interesting turns throughout the series. While not everyone’s ending works, the sweet, gentle note the series ends on feels perfectly in line with the show’s consistently surprising scope and tone. Kimmy’s hard work to do good and to make the world a little brighter pays off. I had my moments of frustration with this show, but I’ll miss it! Much like 30 Rock, it often pulled off a type of weirdness that isn’t really found anywhere else on television. The miscommunications between Lillian and Kimmy about her suicide plans are actually very funny. Zachary Quinto and Jane Krakowski pretending to sit in invisible chairs is great physical comedy. Mikey and Kimmy both being able to recount Titus’ recurring Captain Crunch dream in detail is another surprisingly sweet moment.